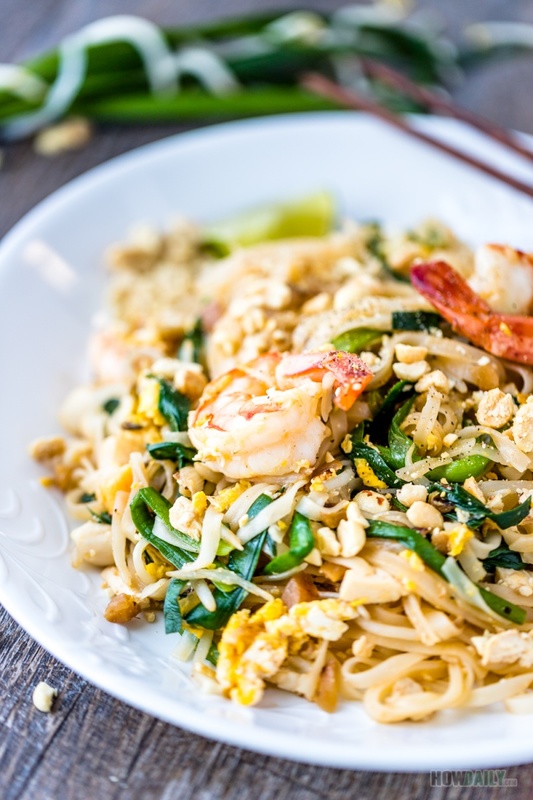 One of Thai dishes that you’d definitely see on top of any Thai restaurant’s menu is Pad Thai. In fact, pad Thai is actually more of a street food in its native country rather than in classy dinning. 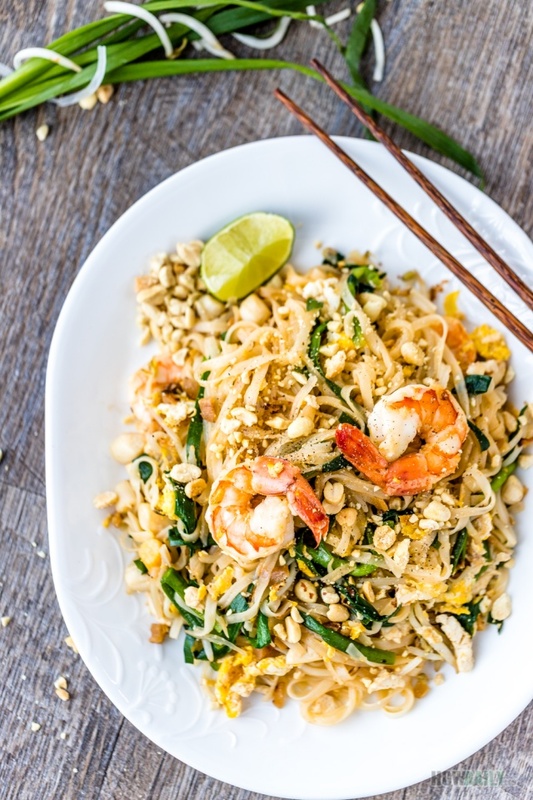 Simply put, Pad Thai is a a dish made of flat rice noodle stir-fried with tamarind sauce, peanut, beansprout and a favorite topping. It usually served with a wedge of lime, some fresh beansprout and extra crushed peanut. Though the dish in its own native is quite spicy and hot, you can adjust based on your tolerance or skip the chili and serve them as extra. Frequent choice toppings are shrimp, tofu or some kind of meat. If you’re like mix of everything, like I do, then pick some here and there (shrimp, crab leg, scallop, mussel, calamari, squid rinds…) or simply grab a bag of frozen seafood mixed. 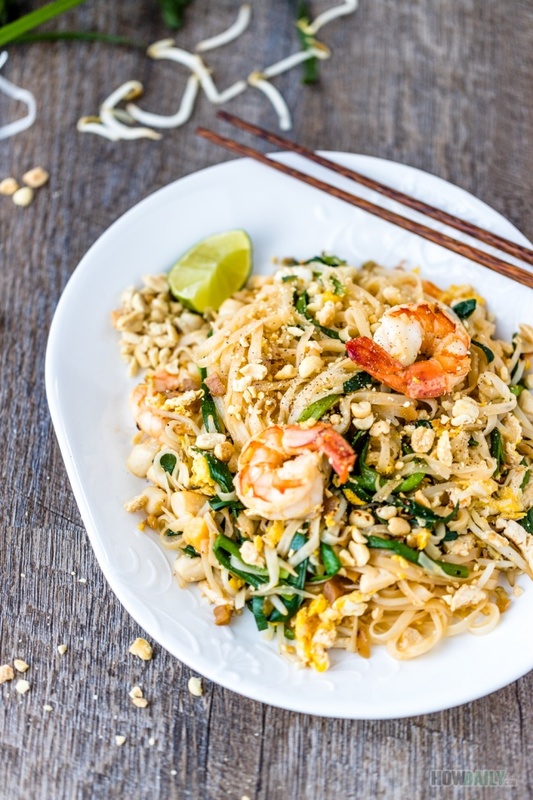 The first will definitely get you better looking, more appealing pad Thai while the later save you time with ok result. The key to this dish beside fresh beansprout, crunchy peanut, crisp of preserved radish is actually the sweet-n-sour balance of tamarind sauce. For this to work best, make sure you’re picking up some tamarind paste, powder, etc…fresh or dried ones work as well. Vinegar can be used as substitution though, the flavor would be lacking of its authenticity. Also, palm sugar is what used to add to the flavor while giving the nice caramel dyeing. Use brown sugar, coconut sugar or anything similar if you can’t find one. Bold and rich flavor rice noodle stir fried with assorted seafood and vegetables in an exotic tamarind pad Thai sauce. This Thai dish is just so delicious that no wonder, it’s the no 1 dish of Thai cuisine. If you’re using dried noodle stick, soak them in warm water for about 10 minutes. Wash and prep seafood topping if needed. Cut tofu and preserved radish into small chips. Cut chive or scallion into match sticks length. Crush peanut or cashew if used. In a microwaveable bowl, heat 1/4 cup of water for 20-30s. Add 2 Tbsp palm sugar, 1 tsp tamarind paste and 3 Tbsp fish sauce to heated water. Stir to mix. Add 1 to 2 Tbsp sriracha as well depend on you spice tolerant. With a large frying pan or wok over medium-high heat, wait till the pan is hot then add 2 Tbsp cooking oil. Twirl to cover entire bottom surface. When oil is hot, stir in chopped onion. Keep stirring until they’re soften. Now add all the seafood or topping of choice. Stir and cook until they’re 2/3 or half-way done. Quickly transfer to plate and set aside. With the same wok, add a spoon of cooking oil. When this oil is hot, stir in tofu, preserved radish. Saute for about 1-2 minutes. Now add noodle sticks. Stir a few seconds then pour in the mixed pad thai (tamarind) sauce. Keep stirring to prevent noodle from sticking together. Do this until all noodle sticks are cooked. Add water (two Tbsp at a time) if need. Once all noodles are cooked, tuck them to a side, break 2 eggs onto empty area. Wait a couple second until eggs cook through, then start mixing noodles and eggs. Add back the half cooked topping, stir a couple minutes till they’re almost cooked, now stir in some bean sprout, chive/scallion and a little bit of crushed peanut. Stir to mix them good for 1 minutes. Transfer to plates and serve with wedge of lime, extra fresh bean sprout and peanut sprinkling on top.